Can be sterilized in the microwave in just 3 minutes! Silky soft & patented – for a familiar drinking feeling. Symmetric MAM shape – always fits perfectly in baby’s mouth. The vented base ensures babies can drink quietly and relaxed: Ventilation holes regulate the pressure balance. The milk can flow evenly – without bubbles, without foaming. Simply relaxed. * Proven effect: 80% less colic! The MAM Silk Teat® makes switching between breastfeeding and bottle especially easy - Thanks to its patented silky soft silicone surface. 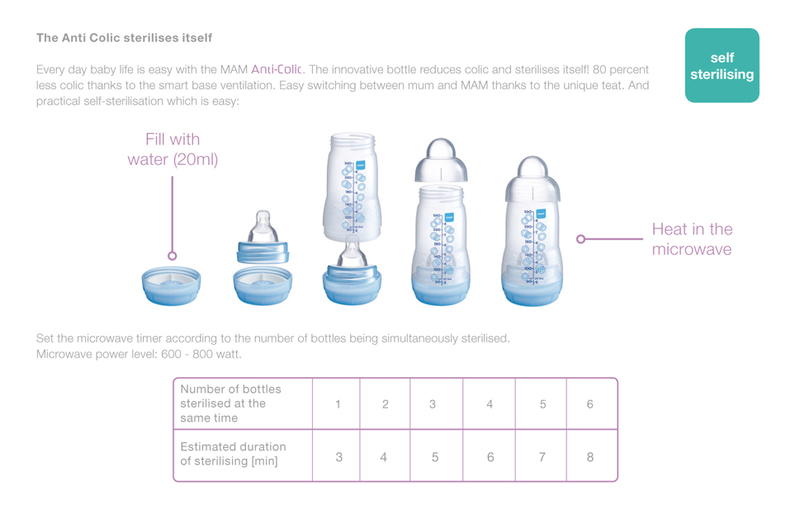 The sterilizing Anti-Colic bottle can be taken apart in 3 easy steps. They can be sterilized in the microwave – quick and easy without a separate sterilizer. Also ideal for on the go!